Wow. Rachel Caine wasn't kidding with the end of Ill Wind. 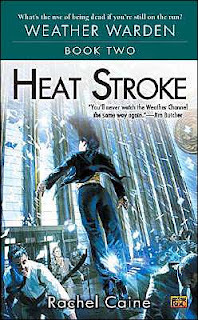 And the second Weather Warden book, Heat Stroke, takes that unexpected ending and runs with it. Wild. And Jo doesn't get much more of a breather than the reader does as she's plunged headlong into life as a Djinn. Or one half of a Djinn. Or a Djinn in training. Who can tell for sure? Good thing the lovely David is there to help her get a grip on her new reality. Unfortunately, it turns out David broke a few not-so-minor rules when he saved her life and the head Djinn Jonathan isn't happy with him. No, sir. Jonathan's not a bit happy. Before she can catch her breath, he turns Jo over to the rather dubious (but hilarious) Patrick to complete her training. In a week. Or die. And if Jo dies? Yep, you've got it. David'll be gone too. *sob* Of course, it's Jo we're talking about here. So the words "fighting chance" actually mean something. Plus, where Jo is, Lewis can never be very far. And with Lewis lurking about, waggling his fingers at the cosmos, channeling a grown up Charles Wallace Murry like nobody's business, chances of surviving an apocalypse are slightly better. Even so, nothing is as it seems in this book and you can't necessarily trust who you thought you could. I've tried to avoid spoilers for the following books in the series, so I don't know where Caine is going with all this mayhem, but I kind of dig it. Gives the whole series an unsettling, fly-by-the-seat-of-your-pants feel while keeping the characters consistent and very, very interesting. Hey Angie - I've enjoyed everything I've read from Rachel Caine. Can't help but envy Jo with David sounding so yummy. :) Loved your Weather Warden reviews, and thanks so much for linking to the interview! No joke. David is one hot ticket. And thank you for the interview. It finally got me into this series.